« Upcoming Campaign Weekend for Eric Watson: YRs Can Make the Difference! Tennessee Young Republicans flocked to Cleveland, Tennessee on the weekend of January 7 and 8th to help out the special election campaign of Eric Watson, a Republican running in State House District 22. Watson was running in a special election to fill the seat of Chris Newton, who resigned following his indictment in the Tennessee Waltz scandal. Young Republicans from Memphis and from nearby east Tennessee counties (Meigs, Bradley, and Hamilton) and Doug Grammer, Georgia YR chairman, came in to help Watson with door to door activity and holding signs at major intersections in Cleveland.Young Republicans knocked on about 500 doors the final Saturday of the campaign. Darrin Kirkus, Tennessee YR National Committeeman, helped organize grass roots campaign efforts for Watson. 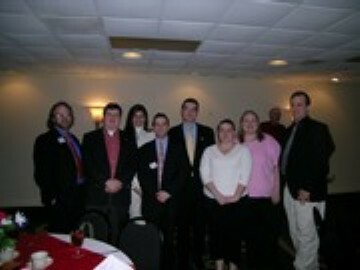 The Tennessee Young Republicans and Meigs County Young Republicans held a dinner for Eric Watson on Saturday night at the Holiday Inn Cleveland. State Representative Dewayne Bunch (Cleveland) inspired attendees to get out the vote for Watson to ensure his victory in the election. YRs in attendance had a great time at the event! On Thursday, January 12th Eric Watson defeated Democrat Sally Love by a margin of 58%-42%, which increases Republican representation in the House to 46 members, just four short of a majority. The Watson campaign is a sneak preview of campaign activity Young Republicans will participate later in 2006!